Eric Draitser: Today I have the amazing special opportunity to speak to someone whom I really admire, really respect, whose work I follow regularly, and I think we’re all going to benefit from her perspective. It is Dady Chery. She is a Haitian-born journalist. She is the co-editor in chief of News Junkie Post. She is also the author of a brand-new book, which everyone needs to pick up, which we will talk about in depth. 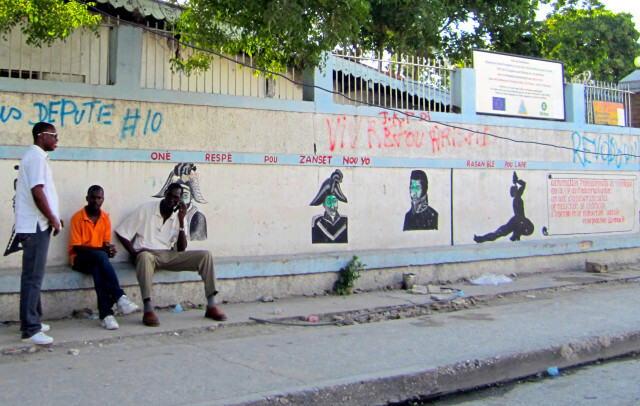 The book is titled We Have Dared to Be Free: Haiti’s Struggle Against Occupation. This is a critical work, something that contributes to the discourse. This is really a must read: something for everybody who is interested in the contemporary politics of Haiti, the history of the country. With that out of the way: Dady, welcome to Stop Imperialism. Dady Chery: Thank you very much, Eric. Pleased to be with you. I would like to talk a little bit about Haitian history. In 1791, Haiti was the wealthiest colony of France, and Haitians had a revolution. 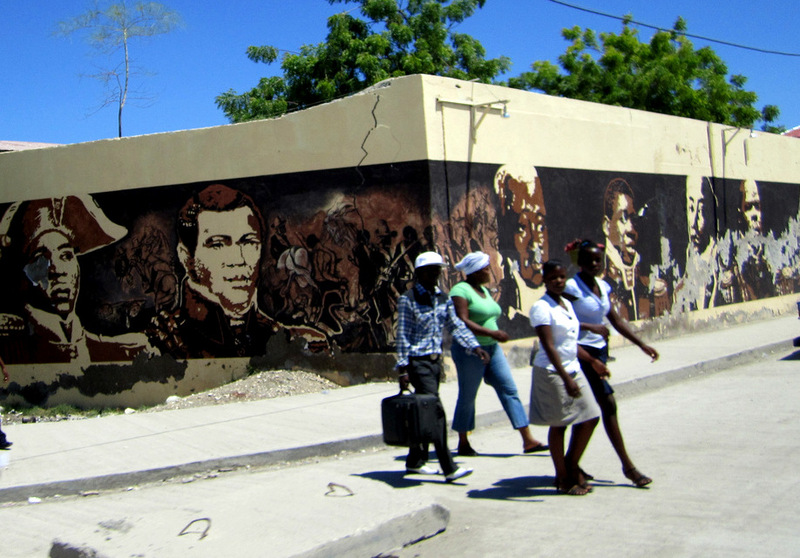 The Haitian Revolution began as a Vodou ceremony. It was started by a Vodou priest, and there was a meeting in the woods called Bois Caiman, at which the Haitian slaves decided that they were going to burn everything, they were going to kill their masters and be done with slavery once and for all. At this ceremony, there was a woman who was possessed by the Haitian goddess Ezili Danto, who declared “We will make no more slaves!” From that point, the revolution started. Toussaint L’Ouverture actually did not enter until later. He was 33 years old, and a fairly old man for the times, but when he decided that he was going to contribute his know how to the revolution, it was much later. He started out leading a few hundred men and ultimately led tens of thousands. He joined forces first with the Spanish and English to beat the French, and after he got done beating the French, he beat the Spanish and English out of the island. He beat the Spanish out of the eastern part of the island, which is where the Dominican Republic is right now. What I love about this revolution is the idea that people who were just so downtrodden at the time, people who grew up from 10 years old, 12 years old, being slaves, decided that they could actually change their situation. And they did! It led to the only successful slave revolt in all the world. Part of the reason I think that slave revolt was successful is not only because it was against imperialism, colonialism, etc. ; it was also against racism. Toussaint was very well respected even by the people he fought against, and he wound up having a lot of allies in the French government: people who were giving him intelligence about everything that was happening in France. So, when Napoleon, for example, decided to attack, he knew. He knew exactly who was coming and how many men. He knew all of it. So it is an amazing example for the world. Ultimately, after Haiti was lost, Napoleon gave up the Louisiana Territories. I think a lot of people don’t realize that the Louisiana Territories are not just Louisiana; they are about a third of current-day United States. That’s how important Haiti was to France. The Haitian Revolution continued beyond that. After the country was started and it was young, it helped Latin America gain its independence from Spain. It wasn’t supposed to do that. In the Haitian Declaration of Independence, there’s a clause that says we’re basically going to be isolationist. But the Haitian leaders were absolutely committed anti-slavery people. And so, when people like Miranda came, who was trying to liberate Venezuela and, later, Simon Bolivar, the Haitian leaders not only helped them with weapons and with logistics, but also actually gave them men. There were Haitians who fought in the liberation of South America. In South America: northern Brazil, Guyana, Venezuela, Ecuador, Colombia, Panama, Peru, Costa Rica, Nicaragua and, of course, Bolivia owe their independence to Haiti. ED: Dady, I think this historical context is really important. One of the things that I think is such a misconception and perhaps the product of some of the contemporary history in regards to Haiti is the notion that Haiti is a “poor country” when, in fact, Saint Domingue and later Haiti was in fact the crown jewel of the French empire, and it was by far the richest colony. It was a huge money maker for the French. It was endowed with a lot of economic opportunities. So when we think about Haiti as “the poorest country in the Western hemisphere,” what we’re really talking about are some of these important historical processes that have taken place in terms of Haiti’s development, that have put it in that situation, rather than any natural deficit. DC: Absolutely! France came back and demanded that Haiti pay a debt for kicking out the French. Later on, of course, there was the US occupation: the US took over Haiti between 1915 and 1934. During that period, Haiti was paying 40 percent of its revenues to the US. When somebody talks about the poorest country in the western hemisphere, I always imagine a picture of somebody mugging you and then calling you poor, because this is exactly what’s going on. 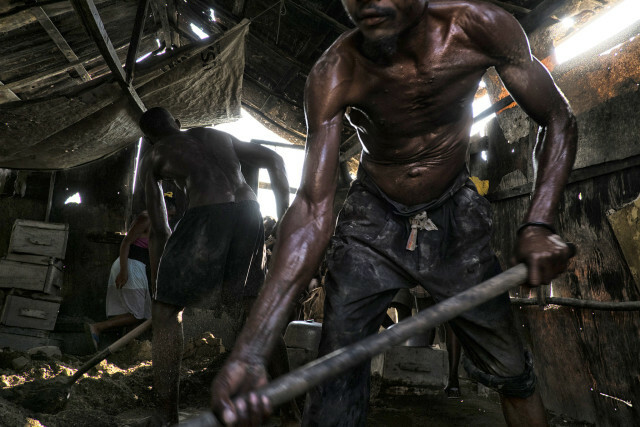 Haiti still has mineral wealth, and this international community that is there now to exploit Haiti is there for the labor. The hard work of Haitians is also a wealth. They’re there for that and the minerals, and the fact – and there is a lot of propaganda and misinformation about that – that Haiti has managed to preserve a lot of its biodiversity. You hear a lot about the mountains being denuded, etc. People, when they look at a mountain highway, or they look at a mine, they don’t actually see the deforestation. They think a highway is very nice. It’s all very manicured. At the same time, if you see a place where people have cut some wood for charcoal, you say, oh well, this is absolutely terrible. But obviously, the highway has done a whole lot more damage in terms of habitat destruction. Haiti has cloud forests that have all sorts of animals. It is considered one of the biodiversity hotspots in the world. The coasts are still virgin coasts. There is fishing there. There is tremendous wealth in Haiti. This whole thing about Haiti being poor is absolute nonsense. DC: Right. And right now, for example, there is about 85 percent unemployment in Haiti, and yet the GDP has been growing by 4 percent every year. The reason the GDP is growing is because they’re destroying the informal sector, and more and more people are exchanging money for services, whereas in the past they used to trade services with each other. And, of course, everything gets added to GDP; nothing really gets subtracted. So loans are added to GDP. You get money from USAID, you borrow from the World Bank, you borrow from the IMF, and it looks like the GDP is growing. It’s magnificent! GDP is not net worth; it’s just how much money flows through a country. So Haiti is growing its GDP, and people are getting hungrier. ED: One of the other things that’s interesting: I think one of the reasons Haiti and Haiti’s Revolution is almost never really discussed, or to the extent that it is, is really minimalized and marginalized historically is that it was a dangerous precedent. It set a dangerous example for all the imperial powers and the burgeoning United States. The notion that a former slave colony, a colonial possession, could not only rise up and defeat its mother empire but also defeat all of the empires in the region and then establish itself in an independent way, this had to be crushed. It was a devastating example for all of the potential imperial rivals. DC: Yes, I think it’s… a fantastic inspiration! Whenever anybody talks about how bad things are, I think to myself: well, during the Haitian Revolution, they had to have been worse, and people overcame that. So it is a bad example. It’s a terrible example to the world. The odds of winning against these major imperial powers were basically zero, and people fought and they won! And we can do it. We can do it today. ED: And the final point on that: I also have to chuckle to myself; when people do talk about the Haitian Revolution, they almost talk of it in terms of some magical phenomenon where the slaves, with no organization or anything like that, rose up and they somehow defeated the French, which is just nonsense. I think that if you read the history, if you know Toussaint, if you know Dessalines and how this whole thing evolved, this was a well-organized, well-orchestrated, long-fought series of battles, war for independence by a very-well organized and actually, I would say to a large extent, well-disciplined military force. DC: Extremely disciplined and in fact, Napoleon was defeated at Waterloo because Russian generals studied what Toussaint had done against the French. Toussaint had this strategy of burning everything so that the invading armies would have no supplies, and that’s exactly what they did. At one point, and I like to think about this, Toussaint’s army was bigger than the US army. I like to think: what if we had decided to go to free slaves in the United States? ED: Well, that would make for an interesting alternate history novel, I think. DC: I would love to do that. ED: Maybe we should collaborate on that novel idea. ED: Let’s fast forward a little bit…. I want to bring people up to speed. I think that, to a large extent, people have a blind spot when it comes to Haiti today and in the recent past…. Let’s focus on the most recent period. What can you tell us about Jean-Bertrand Aristide, how he came to power, how he was removed from power, and why that’s important and relevant to the political context today? DC: He came to power in the 1990-91 elections. He declared his candidacy very late during the electoral campaign, with a few weeks to go, and won by a landslide: 67 percent of the vote. He was a very popular liberation theology priest, had tremendous admiration from the poor, which is of course more than 90 percent of Haitians, and it was a real election. The people that the US wanted for the elections were people who were associated with finance, people like Marc Bazin, who was associated with the World Bank. Within months, Aristide was removed by the military. Very bloody coup: thousands of people killed. He was away for a while, and in 1994 he was brought back by Clinton. I like to describe this as being brought back in a plexiglass box. He was almost always in a plexiglass box, surrounded by guards. The government began to be run essentially by Clinton. A lot of people don’t know this, but in Haiti it’s actually the prime minister who runs the government, not the president. The president names the prime minister, and he does a little bit of foreign affairs. The person who actually sets up a cabinet with a bunch of ministers, etc., is the prime minister. Prime ministers for Haiti have been named by the international community now for decades. The prime minister at the time decided to reduce import tariffs for rice in Haiti and allow dumping of subsidized Arkansas rice in the country and basically destroy a major part of the agricultural economy. 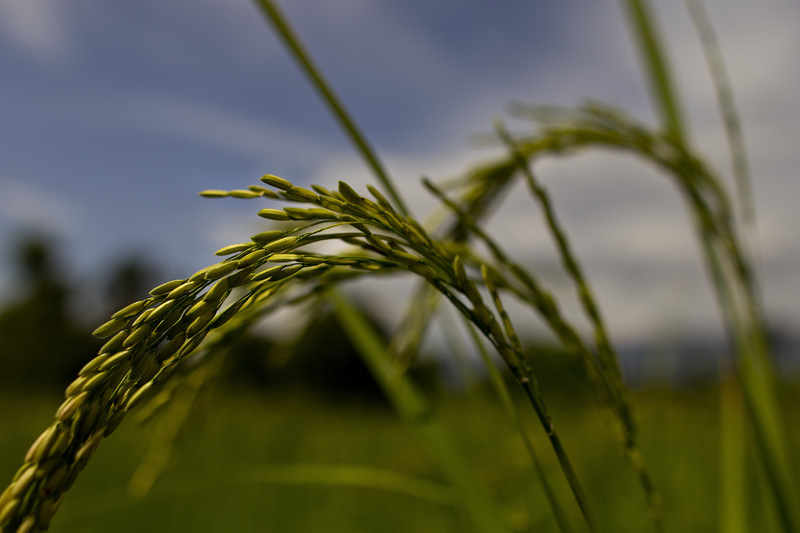 That was Clinton policy to benefit Arkansas rice farmers. ED: Interesting. So this process that began under Clinton…. 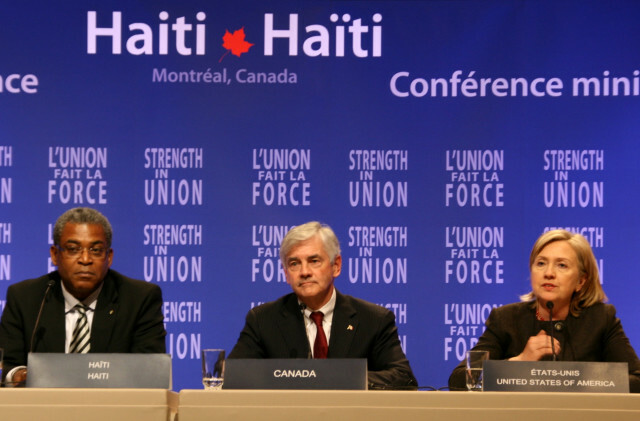 This process of impoverishing Haiti was done under the cover of “humanitarianism,” right? DC: It was under this great humanitarianism. They were going to bring cheap rice for Haitians, some of it to be distributed through NGOs. What they were doing was absolutely killing the country’s agricultural economy. Until the 1980s, Haiti had produced essentially all its food, and before that, Haiti was actually exporting food. 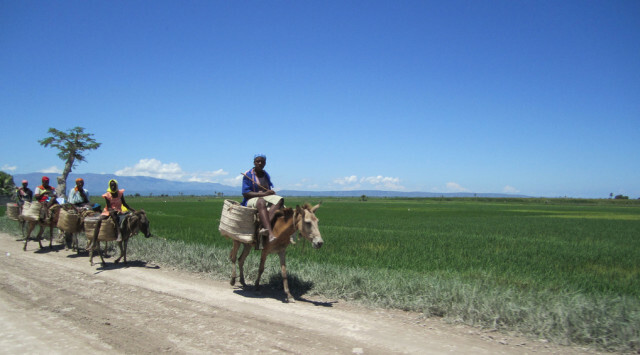 Now, Haiti imports virtually all its food: more than 80 percent of its food. People are actually starving now. It is important to note, though, that it was when Clinton brought back Aristide supposedly to help Haitians that these policies began. Also that’s when the policy began, for example, of transferring tariff collection to an international company, a Swiss company called SGS. All of this stuff started while Aristide was around, with Clinton running the show. Nevertheless, Aristide was removed again in 1996. He came back in 2001 and stayed until 2004. He was kicked out right after he had tried to increase the minimum wage. I think that his being kicked out is partly associated with that. Another thing it’s associated with was the discovery of gold in Haiti. It was kept under wraps. They were saying: well, it’s really copper that’s in those mountains. But it turns out, actually, that they discovered around 2004 that there was gold and silver in Haiti. So Aristide had to be out of the way. In fact, the government that replaced Aristide immediately started giving gold exploration permits. ED: I want to make a connection chronologically here. What you’re talking about, the discovery of these minerals, I think… corresponds directly with the establishment of MINUSTAH: the UN mission inside of Haiti, which is supposedly to help administer the country. Now it seems to me, the timing of these two things is, let’s just say, not coincidental. DC: It was absolutely not coincidental. 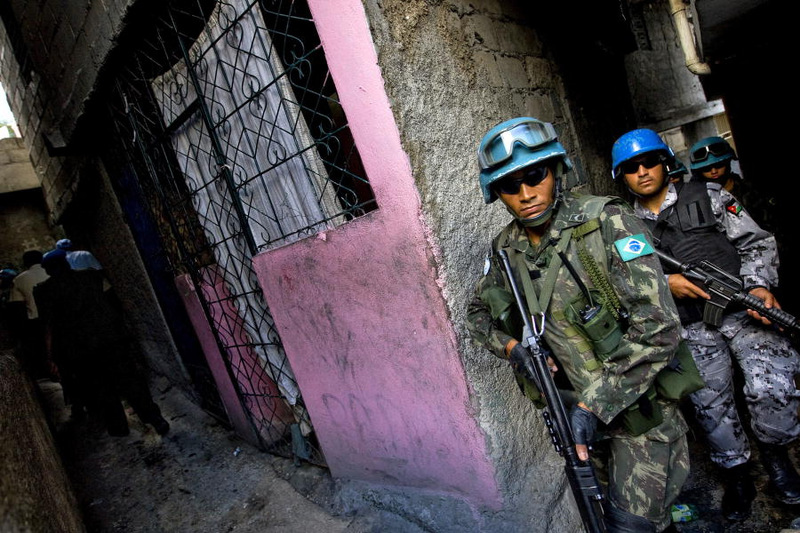 They had Aristide out on the 29th of February, and MINUSTAH was in on the 1st of June. In between, it was the US Marines, and the Canadian and French armies that mopped up and wiped out the Aristide partisans. And then the UN came to maintain this impossible situation. They talk about stabilization. How can you stabilize a situation where there’s 80 percent unemployment, there is hunger… One could say that this is really criminal, what the UN is doing in Haiti. Even before the cholera, even before all the rest. ED: One of the other things that strikes me about all this. I want to get into this UN mission MINUSTAH, as the acronym goes, because one of the things that I find most striking is the very idea that the UN has any right at all to be in Haiti administering that country, because I think that the misconception a lot of people have is that this is purely a relief effort after the earthquake a few years ago. We’ll talk about in a minute. This actually far predates the earthquake; it far predates all the most recent humanitarian difficulties in Haiti, and it’s actually, in my opinion, putting in naked imperialism and colonialism by the UN and the international community. DC: During the earthquake, MINUSTAH and the Haitian police were looking for each other, and they were protecting property, but not helping Haitians. They don’t like this to be said, because they like to present themselves as being these humanitarians who have been helping Haitians, but in fact that is what they did. It really showed what their priorities were. It was Haitians who actually helped each other. In fact, it is always Haitians who help each other. 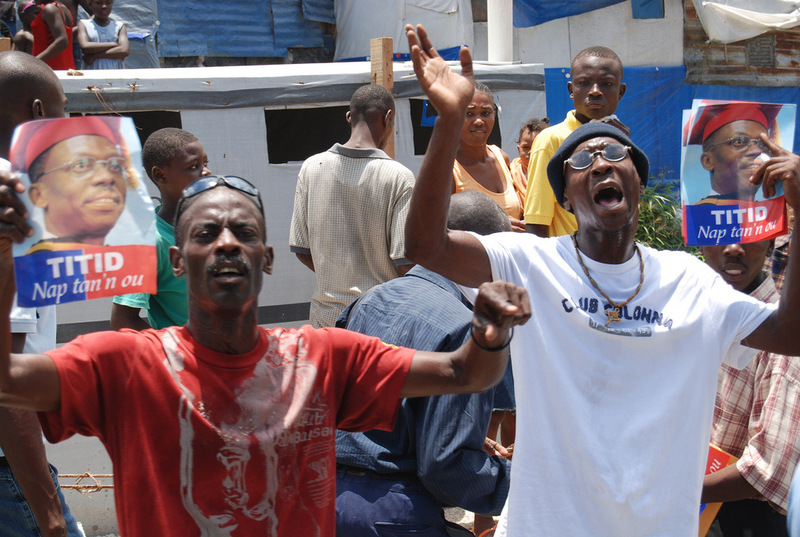 It was Haitians who dug each other out of the rubble. There was one kid who actually just tore a wall so that he could get his classmates out of a building that was collapsing. That was news in Haiti. In the US, you were seeing people who were covered with dust, who looked wholly catatonic and miserable. You had people like Clinton and Paul Farmer speaking for everybody and saying how much aid was needed, etc., and basically laying the ground for receiving billions of dollars, in fact in the end about $13 billion in aid that they went into Haiti to administer. In Haiti, you have a population of 10 million and $13 billion in aid that no one has actually seen, really. You could say that Haitians were the biggest donors of humanitarian aid per capita in the world, and that every Haitian man, woman and child gave $1,300 of aid to the international community, because that is what happened. Clinton and his rich friends moved in, and in a very short period, they took control of the country. The earthquake happened in January. By March 8th, they had the Lower House in Haiti (this would be the House of Representatives) voting on a state of emergency that would allow an organization called the IHRC (Interim Haiti Recovery Commission) to run the country for 18 months, and that organization was headed by Clinton. It had 14 foreigners, headed by Clinton, all rich. The rules were that they were supposed to put down $100 million, or erase $200 million in debt, and in addition provide military. Against that, you had 7 Haitians, all of whom were supposed to be picked by the 14 foreigners. So this is how Haiti was supposed to be run during this emergency period when you would have Clinton managing all of the aid money. 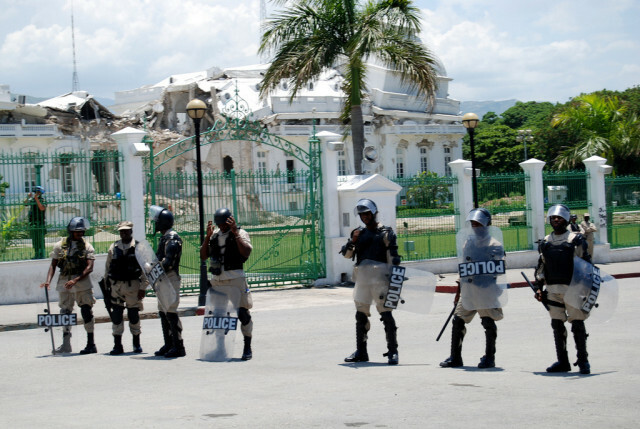 The Haitian parliament was supposed to dissolve itself. It fought very hard. In the senate, the vote initially didn’t go through because of the lack of quorum. They had another vote, and there was finally a quorum. At the end of that, there were rumors that at least 3 senators had probably been bribed to show up so that there would be a quorum for a vote. Now that you had Clinton and his friends administering the country, what happened next – and this is something that you never saw in the American news – is that people from the Haitian parliament went on the streets protesting with everybody else. I don’t know of any situation [in the US] where you’ve had senators and members of the House out on the street leading protests, but this is what happened, and it went on for months, through the summer of that year. These votes were in April. People were protesting that the president had forced this on them, and that the country had been sold to the international community, and they wanted it to be stopped. ED: What’s interesting to me too about this whole process is that Clinton has paraded himself as leading the redevelopment of Haiti, when in fact he is not acting like some kind of an imperial viceroy of the island, but the actual material reality is that he has opened up the real estate speculation, real estate development, and other forms of hard investment such that that $100 million that you were talking about pales in comparison to the billions in profits that are being siphoned off of Haiti for him and his friends. DC: And the corruption is phenomenal! You have roads that are built part way and then stopped, even though the companies are paid. You have, for example, the IHRC taking credit for projects that other agencies paid for. In fact, around the end of the 18 months, the Haitian senate declared the IHRC to be a fraud, and they did not renew it. People are formally demanding that Clinton accounts for all this money and for what he has done as part of this Haiti reconstruction. He hasn’t. It’s very clever. He is also the special envoy to the UN in Haiti. People are trying to find out if… he benefits from UN immunity, because he was at the same time the head of the IHRC. ED: Yeah sure, no conflict of interest here. DC: He completely links all of it. He links the UN occupation to the corruption and mismanagement of the funds. ED: He’s an agent of disaster capitalism. Ultimately, this is essentially using the earthquake as a means of, to be nice we’d say reforming, to be not so nice ethnically cleansing the island and extracting the wealth in ways that they never would have been able to do. The destruction of Haiti’s infrastructure, the destruction of homes, roads, and schools and all of this, opens up all of these possibilities for the exploitation of the island and the extraction of profit. That’s disaster capitalism. 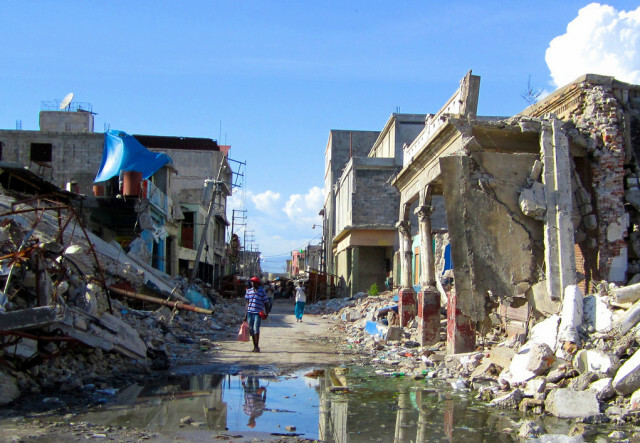 DC: The cities that were destroyed by the earthquake were mainly Leogane and Port-au-Prince, involving a little bit over a couple of million people. The country has 10 million people, and there were other cities, for example, that were unaffected by the earthquake: Cayes in the south, Cap Haitien in the north, Gonaives. All these cities have had their electricity and potable-water supply infrastructures dismantled so that they could be reconstructed! ED: Tells us a little bit about Martelly and his government, because I think this is also a story that is woefully under reported. This guy comes into Haiti from a very suspicious background, with suspicious characters funding him and backing him, and all of a sudden parades himself around as the true leader of the country. Who is Martelly and who backs him? DC: Martelly is an incredibly vulgar musician who was living in Florida until Clinton decided that he would make a good Haitian president. The person he wanted to be president initially was the hip-hop star Wyclef Jean, but Jean could hardly speak Kreyol or French, so that was not particularly believable. Wyclef Jean brought Martelly to a meeting with the Clintons, and they decided that they preferred Martelly. There were elections, and Martelly did not even qualify for the second round, but Hillary Clinton made a special trip to Haiti, and all of a sudden another candidate was out, and Martelly was in. In the second round, he wound up winning. It was such a ridiculous cheat. From the start the Lavalas party, which had more than 80 percent of the electorate, wasn’t allowed to participate in the elections. So in the end, it was only about 20 percent of the electorate that participated, and a Martelly win is pretty doubtful anyway. 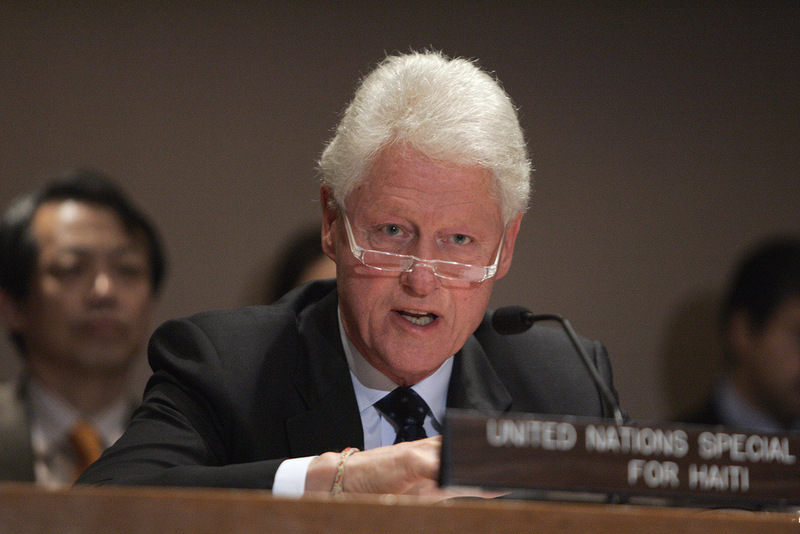 Another thing that Clinton had for Haiti was a plan to change the constitution. After the elections, the first thing the parliament was supposed to do, before the president was even sworn in, was change over 120 articles in the constitution, and they were supposed to do that in a couple of days. It was a travesty. At the end, they didn’t even have time to reread to the parliament the things that they were supposed to have voted on. One of the things that they tried to slip through, for example, was that the president could have two consecutive terms, which wasn’t part of Haitian government. As things stand now, the president can spend only five years in the government and cannot have consecutive terms. They tried to slip that through, and people caught it. In the end, there were so many things that disagreed with what the lawmakers had voted on that they decided they weren’t even going to touch that, and Martelly wound up swearing on the old constitution. But he wound up, basically, introducing every aspect of these revisions of the constitution by decree. Effectively, he has got rid of all the local governance. 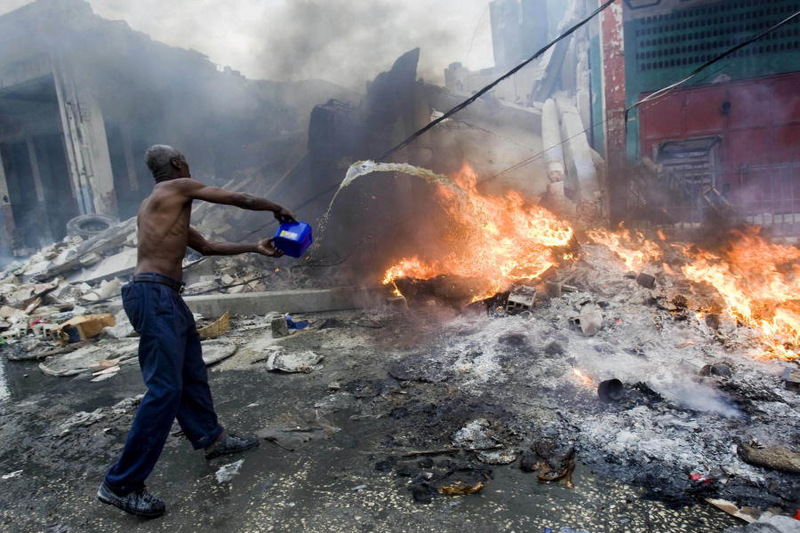 Haiti, right now, I could say, has no government. The only person, who was supposedly elected, who is still in the Haitian government is Martelly. He has replaced every mayor in the country, all the local judiciary. Right now, they’re supposed to be having elections for everything! They just had legislative elections on August 9: a complete debacle. They’re supposed to have the second round of the legislative elections and first round of the presidential elections in October; in December, for Christmas, I think the international community wants to give itself a new Haitian president. I don’t think any self-respecting Haitian politician would have participated in any of these elections. I think you could look at everybody who’s in these elections, and you could say that these people ought not to be regarded as having the best interest of Haiti at heart. ED: I think that’s a severe understatement, to say the least. One of the other things that’s really interesting to me, Dady, is the almost completely unreported story about political repression and violence, in Haiti. Martelly is essentially ruling by decree and appointing these new political leaders, mayors, etc. In conjunction with that, we have seen brutal violence, assassinations, kidnappings, beatings, etc., happening to an indigenous legitimate political resistance that has emerged at the grassroots level. Tell us a little about that and what the political reality on the ground in Haiti is. DC: People have been getting killed. In fact, starting from February, usually until summer, I call that period hunting season. 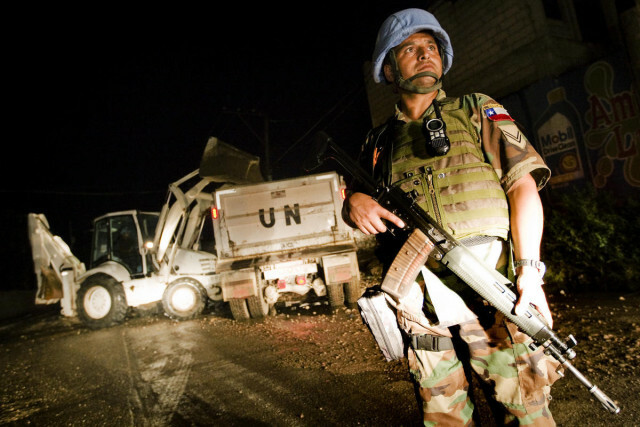 This is a time when political leaders get killed, and this has happened ever since MINUSTAH has been there…. What needs to happen is that MINUSTAH needs to renew its mandate and say that there’s all this terrible violence in Haiti, and therefore they have to continue. Generally, it’s a time that’s very dangerous for any self-respecting politician in Haiti. Quite apart from that, there’s been a lot of land grab. Commons lands have been taken over systematically. There was a system set in place where peasants could work lands jointly, and these lands were not actually owned by specific individuals; they were considered to be owned by the State, and these people were allowed to work them and to sell their produce from them. All of this stuff is being taken over, and as it gets taken over, people fight: people who’ve lived on these lands and who’ve considered it theirs, even though in some cases it is, and in some cases formally it isn’t. People fight, and they get very casually killed. In one particular incident, the La Visite massacre, a bunch of people got killed, and they made the bodies of the women and children disappear. In protests, people get shot and killed all the time. But then there is also a resistance. In the first occupation of Haiti by the United States, there was a resistance force of more than 40,000 peasants fighting the US, engaging the US Marines several times a day. They called them bandits. They dismissed them. At the same time they were building new airports and setting up all this infrastructure so that they could fight this peasant army, they were dismissing them and trying to hide the fact that there was a resistance. I see signs of an actual armed resistance all over the place in Haiti. There are some very big shots in the US police, for example, a guy from the Boston police, who got killed in Haiti recently. There was a MINUSTAH soldier from Chile who got killed. In Cite Soleil a while ago, there was this activist nicknamed Te Quiero who had organized his own police to guard the slum against the depredations of MINUSTAH. According to the people there, a bunch of MINUSTAH snipers came, and they shot him. So there is a back and forth; there is most definitely fighting now. It’s completely reasonable that it would be at this stage now. Haitians aren’t stupid. They know that their country is being taken over, and they have tried non-violent protest. Protest to whom? You have Lavalas, for example, which is the majority party. You have Aristide, who should actually be the legitimate president of the country, who is under house arrest, hasn’t said a word in years. You have Lavalas protesting. How can you protest if you are the government? What you actually need is a shadow government: a government in absentia that will take over ultimately. ED: And that requires international solidarity work. That requires organizing inside of Haiti as well as the Haitian diaspora. That requires a number of things. I don’t think I’m in any position to comment on this, but I don’t think that Haiti is anywhere near that level of organization, is it? DC: It requires solidarity work. It requires solidarity with people in Latin America who are actually fighting the same forces. I think that this has to be done. You have these people in MINUSTAH who do tours in Haiti and then go back to their countries to repress the indigenous and to do urban warfare. They come to Haiti, for example, to become habituated to urban warfare, because people have this natural resistance to urban warfare against citizens of their own countries. But they do it to somebody else, and they come back: no resistance. No problem. You go to any country in Latin America now, places like Brazil, even Venezuela, people live everyday like they are under lock down. You cannot go to an apartment without getting through a couple of gates and a guard. Just normal apartments where people live. People are living behind these walls, and they’re guarded everywhere. You cannot go to a supermarket, a movie, a ball game, without running into a bunch of military. And these people contribute nothing! They’re being supported by everybody else. Latin America is getting very heavy on the military. They do six-month tours, and they come back. The army keeps growing and growing, and people are like frogs in hot water. The water is getting hotter and they don’t realize what is happening to them. They are completely under guard and at the mercy of this massive police and military, all over Latin America. ED: You’re actually, as far as I know, the person who actually broke the story on the cholera outbreak in Haiti. I want to talk a little about that and the role of the UN in actually importing and spreading it in Haiti: not only the role that they played in bringing it into Haiti but also the denial, the misinformation and outright lies and unwillingness to admit that that’s what happened. Talk a little about that and what that tells us about the larger role that the UN is playing in the country. DC: The way the cholera was brought in Haiti is that the UN took 1,280 Nepalese soldiers to train in summer 2010 in Kathmandu in the middle of a cholera epidemic. They gave them very cursory exams and a 10-day leave all over the country and then brought them back to Haiti and set them up in three bases around an area where there was rice growing and tributaries to a river. One of the bases had a septic tank that was basically dripping down into, ultimately, the Artibonite River. The first thing that happened is that a bunch of rice farmers got wiped out. They got killed. It was very clear from the start that the cholera had been brought in from a foreign source. There had been no cholera in Haiti for over a hundred years. It had been brought in from a foreign source, probably the UN, and I wrote this the day after the first case of cholera became known. It turned out that there was a mayor, in Mirebalais, in the area, who had been writing to the UN demanding that they clean up their septic tank, that the smell was becoming intolerable, that this was unhygienic, and the UN wasn’t responding to him. He finally got the attention of the press. It was very clear, because the cases of cholera were down river from the UN bases, and there were no cases up river from these bases. They immediately started saying, it’s the unhygienic internally displaced people camping in Port-au-Prince who were the source of the cholera. At the time the cholera started, there were people in prison dying of cholera, and as a scientist I was saying to myself, wait a minute here. To die of cholera, you need to drink a very high dose of the bacteria. How do people in prison wind up drinking river water? ED: What I find so disgusting about that whole episode… Pardon me for voicing a little outrage on this issue. It’s so deeply racist, in my opinion, and such an imperialist, colonialist mentality. Cholera, they associate with poverty, that these filthy disgusting people living in filthy disgusting conditions brought cholera upon themselves, and now they’re dying of it. What else should we expect? The plague, and all of the rest of this: it’s nonsense! It’s imported and imposed on them, and it’s sick that even today, years later, they still refuse to admit it publicly. DC: Exactly! Cholera is supposed to be a disease of the poor and, of course, poor people get it because their water supply is completely independent from the water supply of rich people. And I think the idea is that Haitians were supposed to become pariahs in the world. They were supposed to be dirty and to have disease. It was Haitians who found it. Haitian epidemiologists collected the information about the cholera, and they put together forces with a French epidemiologist, Dr. Renaud Piarroux, who made it known to the world that the cholera happened in a very pristine area of Haiti, not in the displaced-person camps at all. Another thing I want to say about cholera: right now, at this very moment while we are talking, there are American scientists studying cholera viruses that were introduced in Haiti from Bangladesh, okay. So the UN has introduced cholera in Haiti, not once, but actually multiple times. They’ve been bringing in Bangladeshi MINUSTAH soldiers. In Bangladesh, cholera is endemic, but it’s a completely different strain of cholera, a very nasty strain of cholera that has all sorts of antibiotic resistances. 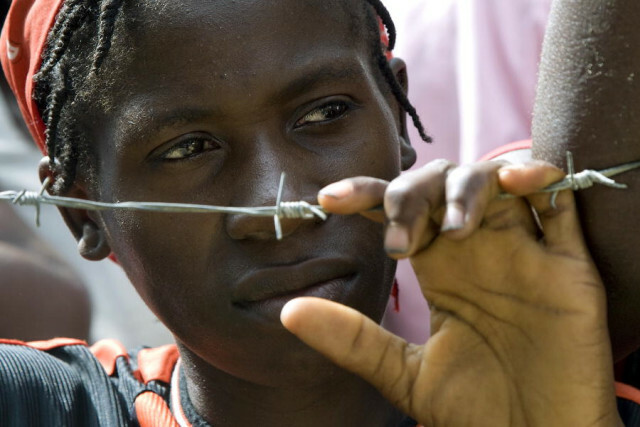 So now, when we talk about outbreaks of cholera in Haiti, and I would really challenge people to go and test this, I think that the cholera they’re talking about is not the cholera that was introduced in 2010 at all any more, that there are actually new cholera epidemics being introduced all the time…. And it’s not just Haiti. Bangladesh has made a business of contributing soldiers to UN peacekeeping, and they’re all over the world. 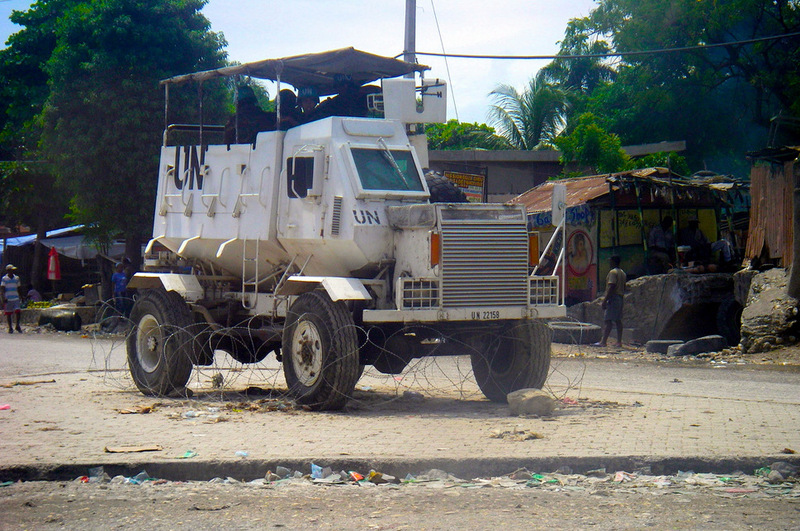 You could follow the peacekeepers all over the world, the DRC, etc., where cholera is flaring up all the time. In Haiti, we caught them at it, but I think this is not the first time they’ve done it and certainly not the last. Not in Haiti and not anywhere else. ED: Remind me, after we’re done recording: I’m going to try to get some information to see if I can write that up, because that’s a really devastating story that needs to be told. Dady… I want to talk about your book, because the reality is that our conversation can only really scratch the surface of a lot of these issues. They’re so complex and multifaceted…. 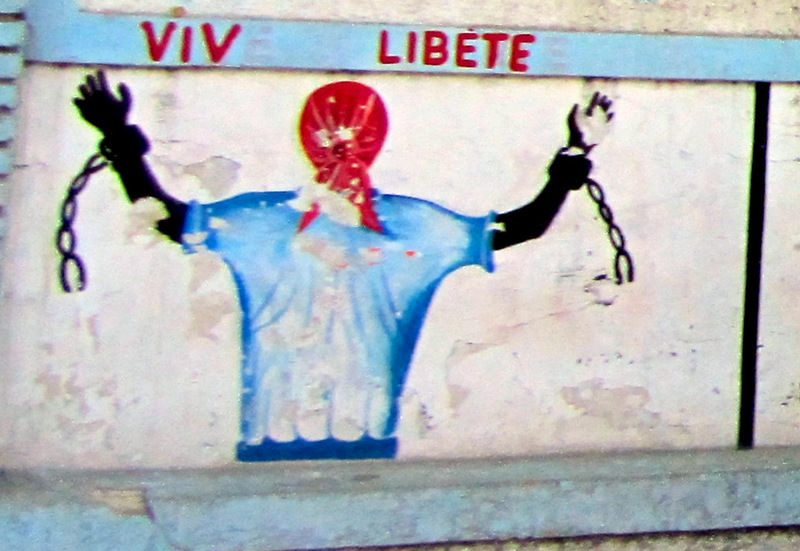 The book is We Have Dared to Be Free: Haiti’s Struggle Against Occupation. Let’s talk a little bit about that. What do you mean about the struggle against occupation. We’ve talked about the UN and the international community. Focus a little bit more about the thesis of your book and some of the highlights, some of things you would like to tell people…. DC: “We have dared to be free” is borrowed from Jean-Jacques Dessalines, who fought the final battle for Haitian independence. It’s directly from the Haitian Declaration of Independence. 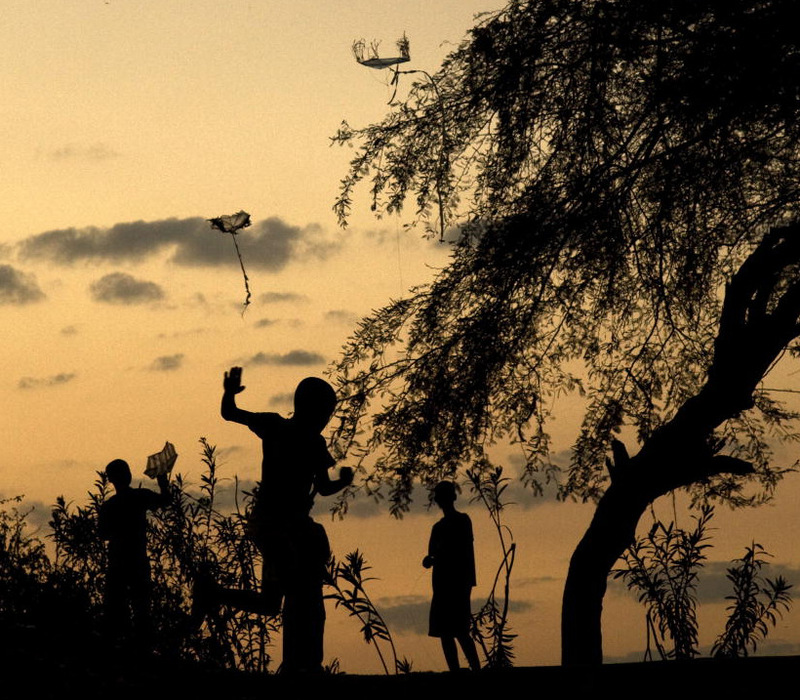 It’s a beautiful, poetic document in which he writes, “we have dared to be free, let us be free by ourselves and for ourselves,” and he compares our revolution to the first steps of a child who has learned to think of his weight, not as an impediment, but as a tool to break the boundaries of space. In Haiti, when you refer to Dessalines, everybody knows what this is about, everybody knows that you’re not playing. You’re talking about a real revolution. You’re talking about a real change, a real fight. 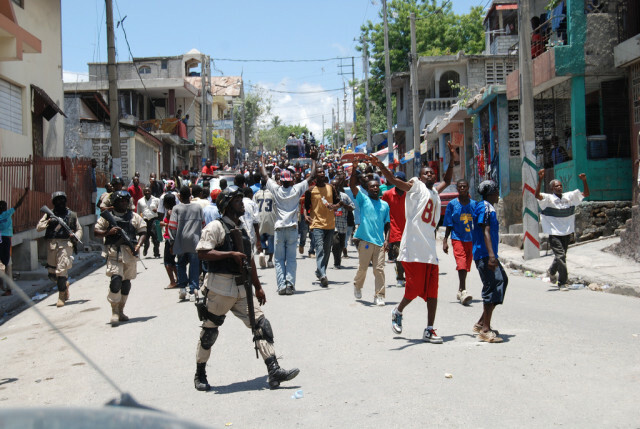 The Haitian revolution is an ongoing revolution, and we are currently under occupation. Occupation is not a nostalgia thing. It’s not something we talk about that happened a hundred years ago. Haiti is occupied right now. It is occupied mostly by the US, France and Canada, hiding behind this humanitarian imperialism, this international community that’s coming to stabilize, etc. But what they are doing is that they are settling the country with a bunch of people who belong to NGOs. Currently in Haiti, there is one NGO per thousand persons. I’m not talking about one NGO person, one NGO! And I say that if we could extrapolate to one NGO per Haitian, the Haitian would be dead! We need to stop this. It is basically the same model as the outright occupation that was there in 1915 to 1934, but there is this veneer. Back then, General Russell from the US was supposed to run the country together with a hand-picked Haitian president, now you have Clinton and the hand-picked Martelly. Back then, it was the southern democrats who had funded Wilson who came to the country, lived in villas in paradise while Haitians slaved away to support them; right now, it’s the NGOs. You can find all these connections and analogies. 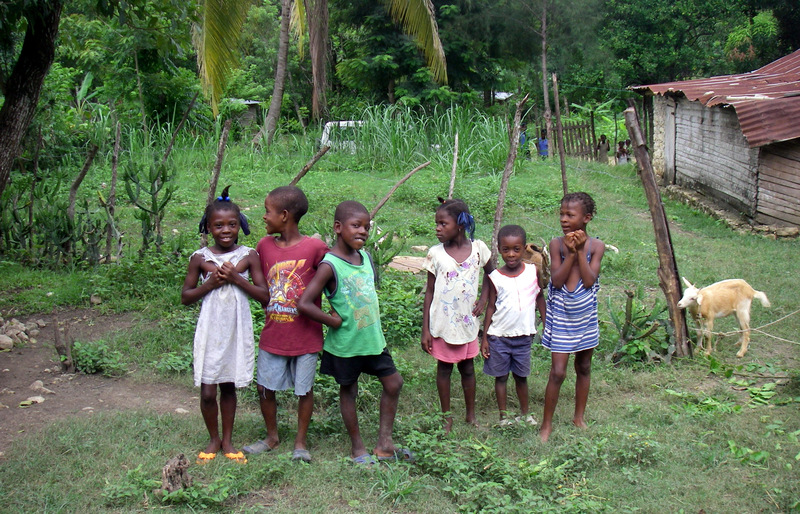 I began to write while I didn’t know what was happening to my family in Haiti after the earthquake. I began this kind of record keeping. It began as a journal. Over time, it grew into a book. It’s about my observations of every aspect of Haiti over the last five years. I bring to it my own scientific background, knowledge of Haitian history, my own knowledge of growing up in a government when there wasn’t US aid. Haitians were poor but not desperate. Things were not the way they are now. I talk about Vodou and Haitian culture, which are things that I’ve been exposed to and which I think are extremely valuable. There is this tendency to disparage everything that the Haitian poor practice, but the Haitian poor are the real Haitians. If Haitians go to France, and they speak French and pretend they’re French, people will ask them, what’s your culture? What makes you Haitian, really? What makes us Haitian is the art, the religion, etc., and Vodou is absolutely central to all of it. So I place all of this in the context of the culture and history. Even though I talk about all the bad things that are going on, I always come back to the idea that we did it. We did it against impossible odds, and as bad as things are today, they are not the way they were in 1791. ED: That’s a beautiful point. I want to push a little bit on this issue, because my own personal experience in Brooklyn where we do have a sizable Haitian community, and I was teaching high school when the earthquake happened in Haiti, in a neighborhood that had a lot of Haitian immigrants. We actually had a number of young girls who had come from a school that had been destroyed. They had come to Brooklyn. I’ve had discussions with a number of people in the Haitian community, and those who are Haitian-Americans born in the US. Tell me if you think I’m wrong and what your feelings on this are, but I find a major disconnect between their conception of themselves and Haitian identity. I have seen Haitian-Americans who almost completely disavow their Haitianness and don’t want to have any kind of connection to Haitian culture, as we’re talking about, to even the language, the religion, etc. Is that something you’ve encountered in the diaspora community, and do you think it has a pernicious effect on Haitian identity? DC: Oh yes, I’ve encountered that. I’ve also encountered some things about the diaspora community that I think aren’t particularly Haitian. One of these that I think is extremely damaging is racism. This is not Haitian. We won that revolution because we were not racist. You cannot win a revolution against racism while being racist, and I think that’s exactly the way it should be. This idea is that we’re not going to talk to white liberals. We’re going to sort of create this little Haitian ghetto and talk to each other because we’re black and we trust each other. I’ve had people at one point accuse me of being the same person as Gilbert Mercier. ED: Anybody who’s ever talked to Gilbert will know how absurd that is. DC: And we both know how absurd that is too. They accused me of being Gilbert Mercier, and there was a fair amount of self hatred in it. I think the idea was, well, I was too smart, I was too articulate, etc., to be Haitian. So, I’ve come out now, and I’m interviewing, and the same people who wanted me to show how Haitian I am, I notice, are not offering to interview me in Kreyol when I would gladly oblige them! ED: I’m really excited and happy to hear you talk about how the book, although it’s about the political, economic and humanitarian issues, it is also a book that delves into the cultural side of this. That is very important as well, because… the idea of building solidarity internationally, part of that process is in recognizing the importance of the cultural identity and using that as means of bringing together, not only the community abroad but also allies who will stand in solidarity with the people of Haiti, just as we stand in solidarity with the people of Libya, Syria and all of these places that are under imperial assault. DC: Yes. There is a lot of good will from Americans toward Haitians… When the earthquake happened, there was this outpour. The same people want to know what’s going on in Haiti. What happened to the aid that we sent? I think my book addresses those kinds of questions…. ED: One last point, I want to mention for listeners. You can maybe go back to my interview on the podcast with Gilbert Mercier, talking about the post-Katrina situation. We talked about disaster capitalism and a lot of the same problems. The same elements that we’ve discussed here in regard to Haiti were very much true in New Orleans after Katrina. So what we’re seeing is that these are not isolated incidents but, rather, there is a greater process at work. Disaster capitalism, neoliberal colonialism, neocolonialism, all these things are interconnected, and I think we need to understand them from a global perspective because, in many ways, just as it was at the end of the 18th century, Haiti is really the front lines of the struggle against all of this. DC: We really are…. Those things that are being tried in Haiti, they are practiced on the rest of the world. We talked a little bit about MINUSTAH troops going back home and doing the same stuff. But there are things, for example, like wiping out the pigs in 1982. This was done in Egypt later on. There are countless examples of this. The FEMA trailers that were full of formaldehyde, that they had used in Katrina, they were later moved to Haiti for schools. There were little kids getting headaches. ED: They were deemed unfit for consumption for use in New Orleans, so they just shipped them out to Haiti, where human life is even cheaper. DC: That right. It’s all connected. It’s really the same predators who are working the whole world. Whatever works in Haiti, they’re going to move it, and they’re going to apply it everywhere else. You look at somebody, for example, like Edmond Mulet, who ran MINUSTAH during the earthquake and for several years after. A news story blew up about him: they accused him of trafficking children back when he was a young lawyer in Guatemala. Now he stands to become the president of Guatemala. These people go to Haiti where they’re finished, like cattle in a lot that are getting finished except what they’re getting polished on is corruption. They get to meet each other and to be completely corrupt, and they are sent back to lead their countries, to head their countries’ foreign affairs, and to establish policy in their countries. So yes, people should be interested in what happens in Haiti. They should be watching these people and stopping them before they finish in Haiti and come back to them. ED: Yes, exactly. We’re out of time for now…. There are so many other things that we need to discuss. Again, listeners, you’ve got to get the book. I think that this is a really important book. Dady Chery: We Have Dared to Be Free: Haiti’s Struggle Against Occupation. Dady Chery, I want to thank you for coming on Stop Imperialism. You can find her work on News Junkie Post. Dady, thanks so much for talking to me today. DC: Thank you very much, Eric, for having me on Stop Imperialism. To listen to the podcast, go to Stop Imperialism. Editor’s Notes: Photographs one, three, four, five, seven, eight and sixteen by Todd Huffman; photographs two, six, ten and twenty by Ben Piven; photographs twelve, thirteen, fourteen, fifteen, seventeen, eighteen and nineteen from UN Photo archive.